If you think of Aspen as a ski town, think again—Aspen is even more beautiful in the summer months. Independence Pass is open, the wildflowers are blooming and fly fisherman are out casting on the Roaring Fork. In addition to the wealth of outdoor activities there are tons of festivals and special events. Here’s an ideal day from our friend, Leslie, who travels to Aspen every summer with her family. There’s something for everyone, in addition to the Aspen Music Festival, two other popular events are the Food and Wine Classic and the Aspen Ideas Festival. Anderson Ranch Arts Center offers over 145 summer workshops. Acclimated to the altitude? Then get ready for a half-day hike to our favorites: Cathedral or American Lake. Last September we hiked the American Lake Trail and though it was challenging, with steep inclines at times, it’s doable if you’re in decent shape. The changing terrain through spruce forest, aspen groves and high-alpine meadows is stunning. The reward is the crystal clear emerald lake at the top! Cathedral is a harder hike, so perhaps try American first, and don’t forget to bring water (a camelback comes in handy). Wake up: Little Nell. I love the location; it’s right at the base of Aspen Mountain in the heart of downtown. Put on your hiking shoes and walk down the hill to Paradise Bakery. Grab a coffee and a banana seed muffin. Since you have an active day ahead, go ahead sneak in a blueberry walnut muffin too! Hike: After breakfast, make your way to the Hunter Creek Trail. This is a great hike for your first day to get acclimated to the altitude. (It’s easy and mostly flat). Climb past the magnificent brook. The trail crosses back and forth over the creek. Be sure to check our some of the houses leaning over the path once you hit the top of the creek. Looking for a harder first day hike? Right in town try the Ute, and really see your heart rate go up quickly! Lunch: Head back to town and rent bikes for the afternoon. (There are many bike shops—I’ve used The Hub of Aspen or Aspen Bike Tours and Rentals in the past). 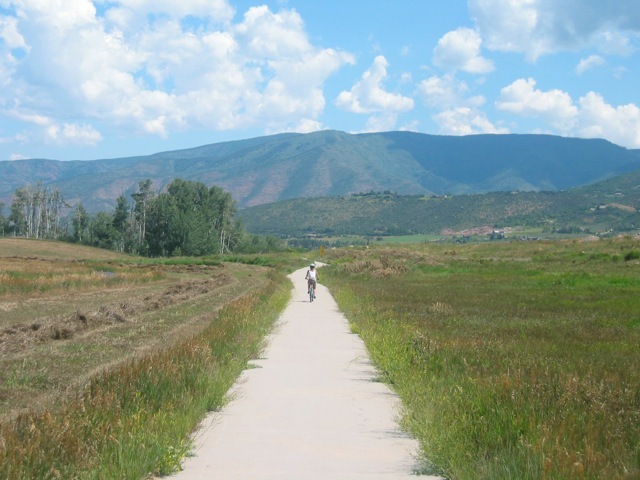 Follow the Rio Grande bike path approximately 7 miles towards Woody Creek. Stop for lunch at Woody Creek Tavern. Their margaritas are must! You can bike back or if you have consumed one too many margaritas call a cab to take you, and your bikes, back to the rental shop. Shop: Wind your way through town stopping at the stores that peak your fancy. Pick up some wine and cheese for later at the music tent. Dusk: Walk or take the complimentary bus from town to the Aspen Music Festival. You can choose to buy tickets for inside but it is much more fun to bring a blanket and sit outside with the hundreds of others enjoying the evening. Dinner: Dinner is up for grabs. It’s been a long active day so probably something casual is best. You can walk to Hickory House Barbeque, Meatball Shack or Kenichi for great sushi. If you want something more upscale, try the Hotel Jerome. Nightcap: Check out whose playing at the Belly Up for live music. Alternatively hit the bar at the Kimpton or at Little Nell.